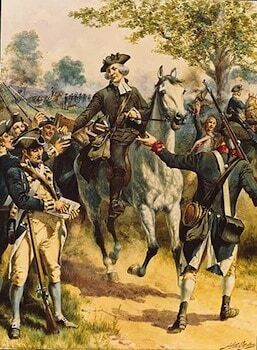 When Hood returned to the West Indies in late 1781 after the Battle of the Chesapeake, he was for a time in independent command owing to Rodney’s absence in England. 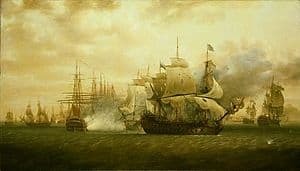 The French Admiral, the Comte de Grasse, attacked the British islands of Saint Kitts and Nevis Hood hoping to salvage the situation made for St Kitts with reinforcements however he soon learned that he was facing a much superior force. De Grasse had landed 6,000 men on St Kitts and laid siege to the fortress on Brimstone Hill. The British fleet on the 24th January consisting of twenty-two sail of the line, was close off the south-east end of Nevis. It soon ran into and captured the French 16-gun cutter Espion carrying a large amount of ammunition for the use of the besieging French forces at Brimstone Hill. 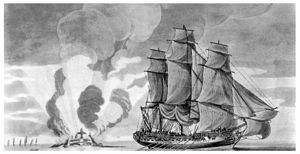 At daybreak on the 25th, the French fleet was discovered standing to the southward of Basseterre, comprising one ship of 110 guns, twenty-eight two-decked ships, and two frigates. Hood stood towards the French fleet, with the apparent intention of bringing on action, which had the effect of drawing the French fleet off the land. This was achieved but no sooner had Hood effected this he was aided by a favourable change in the wind, and took his fleet within the anchorage of Basseterre or Frigate Bay, which the French admiral had quitted. Hood ordered his fleet in an L formation and once this had been achieved he then ordered his fleet to lay anchor. Comte de Grasse, in frustration made three distinct and vigorous attacks upon the British fleet on the 26th but was successively repulsed with great damage to his ships. Losses on both sides were light but the French fleet had suffered considerable damage. Hood managed to stay in the position for another two weeks without further incident. Despite outmanoeuvring De Grasse, Hood was unable to save the island from surrendering to the French, due in part to the French siege of Brimstone Hill, a fortress on the island. This happened on 12 February and Hood left on the 14th. Hood then joined forces with the recently arrived Admiral George Rodney.